Window tint laws in many states are different depending on the type of vehicle you have. Where applicable, window tinting regulations can be significantly different when driving a passenger vehicle or multi-purpose vehicle. Vehicle type is based on federal classification. Your vehicle is likely either a “Passenger Car” or a “Multi-Purpose Vehicle” when talking about window tint laws. In all our state law pages we display this as “sedans” and “SUVs/vans” for clarity. To find out whether your vehicle falls into passenger car or multi-purpose vehicle classification, look for a Federal ID label. This label can be found on your vehicle’s left front door panel. Shown above is an example of the ID label. Your vehicle should have a similar one showing your federal vehicle classification. 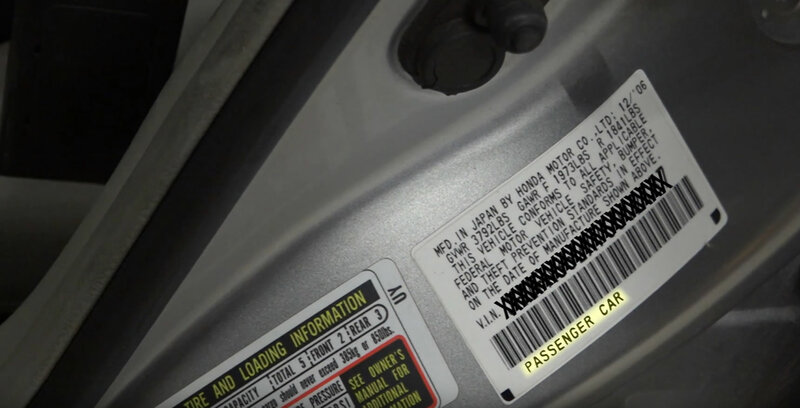 Federal ID label also includes your vehicle’s VIN – Vehicle Identification Number. Which vehicles are “passenger cars”? Passenger Cars federal vehicle classification includes: sedan, coupe, hatchback, convertible, station wagon, hardtop. Passenger car means a motor vehicle with motive power, except a low-speed vehicle, multipurpose passenger vehicle, motorcycle, or trailer, designed for carrying 10 persons or less. Which vehicles are “multi-purpose vehicles”? Multi-purpose vehicles are often also referred to as multi-passenger vehicles (MPV) and multipurpose passenger vehicles. MPV classification includes SUVs, recreational vehicles (RV), pickups, panels, vans, campers, minibuses, sport utility vehicles, and similar vehicles. Multipurpose passenger vehicle means a motor vehicle with motive power, except a low-speed vehicle or trailer, designed to carry 10 persons or less which is constructed either on a truck chassis or with special features for occasional off-road operation. MPVs often come with factory-installed window tint under 70% VLT on back side windows and rear windshield. By law, visibility through windows behind driver is not required on these vehicles. This is why MPVs can have any factory-installed darkness. Also see: What is VLT? Other vehicle types can include truck, bus, motorcycle, trailer, or low speed vehicles. You can find more information about classification in 49 CFR § 571.3 (Code of Federal Regulations). Vehicle manufacturer determines the classification. Owners of crossover SUVs should refer to the ID label to confirm their vehicle classification. How is minimum tint transmittance determined? National Highway Safety Traffic Administration (NHTSA) sets the standards for vehicle manufacturers. Minimum of 70% VLT (Visible Light Transmission) is required on vehicle’s windows, as based on Federal Motor Vehicle Safety Standard 205 (Glazing Materials – 49 CFR §571.205). Does this mean all window tint with 70% is legal? Absolutely not. Most states do not permit any aftermarket glazing installed, especially on windshields. This is because most are already factory-tinted. Applying any level of aftermarket tint may put your windows darker than 70% VLT. Our custom-developed Tint Tester tool can help you preview window tint darkness and we highly suggest using it. It’s important to differentiate between manufactured or factory tint, and aftermarket tinting. Windows tinted darker than state’s tinting laws can be legal in case your vehicle is manufactured as such. Do not forget to read tint laws specific to your state to find exact permitted VLT percent, and to learn if any aftermarket window tint is legal.